Interlink Electronics provides a suite of technology solutions designed for applications requiring handheld user input, menu navigation, cursor control, and other intuitive interface technologies. These solutions include Mouse, Pointing & Touchpad products as well as Piezoelectric Force Transducers, Force Sensors and Position Sensors. This Application Guide provides an overview of Interlink Electronics solutions, applications and benefits. The AM Sensor Line from Interlink Electronics provides constant and dependable antimicrobial product protection and an added level of defense against damaging microbes for the useful lifetime of the products. The touchable surfaces of the AM Sensor Line inhibit the growth of microbes on contact, working continuously to maintain a consistently lower bio-burden than would be expected on a product without antimicrobial protection. The AM Sensor Line gives any application a competitive advantage in a world that focuses on cleanliness. Interlink Electronics provides a suite of solutions designed for rugged and industrial applications requiring handheld user input, menu navigation, cursor control, and other intuitive interface technologies. Many of the world’s top electronics manufacturers have applied Interlink Electronics solutions in a variety of mission-critical and rugged applications. 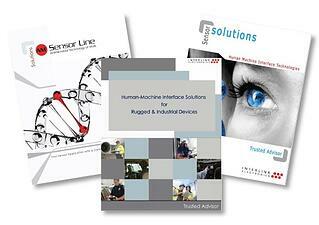 This Application Guide provides an overview of Interlink Electronics solutions, applications and benefits.